Have you ever thought about the carbon dioxide (CO2) emissions generated by the simple, or perhaps not so simple, act of doing your taxes? Neither had we, I’ll admit, until recently. Did you know that as of 2016 roughly 90 percent of Americans e-file their taxes? But for a long time that wasn’t the case. 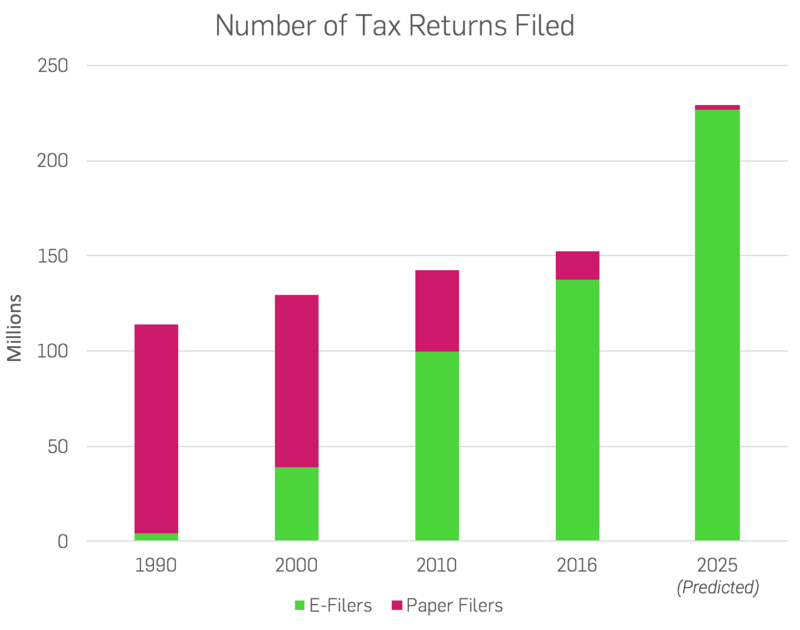 Here at Tendril, we wondered what the CO2 impact has been as the United States shifted from a majority of paper tax filers, to today’s majority of e-filers. Because e-filing saves loads of paper, naturally we speculated that the shift from paper filing to e-filing would greatly decrease the overall CO2 impact of tax filing. But to our surprise, the results of our inquiry led us to a contradictory viewpoint. E-filing became available nationwide as of 1990, but at that point only about 4 percent of the country opted for it. In 1998, Congress set a goal to have 80 percent of tax returns e-filed, and because of its many benefits (e-filing is fast, safe and easy, to name a few) by 2011 the government enacted legislation that requires all paid tax preparers to e-file. The following table shows the steady rise in popularity of e-filing since it became widely available in 1990. You may be wondering how e-filing could possibly be responsible for more carbon emissions than paper filing, especially at such a high margin; so are we. From our investigation, we approximated that the carbon cost of one paper-filed tax return is roughly 0.35 pounds of CO2. The carbon cost of one e-filed return is roughly 3.15 pounds of CO2 - more than nine times as much. It’s important to note that certain assumptions needed to be made which can be reviewed in full below. For instance, the electricity used to do taxes electronically can vary based on the type of machine used (laptop vs desktop) and the age of that machine (a computer in 1990 would have used significantly more electricity than one in 2016). We estimated that range to be between 70-300 watts. We calibrated our measurements to 200 watts - a conservative number that would take those unknown variations into account. That being said, let’s dig into these numbers a little deeper. Using our 200 watt average, we estimate a typical e-filed tax return is equivalent to driving about 3.4 miles in a standard passenger vehicle. A paper filed return equates to 0.38 miles. 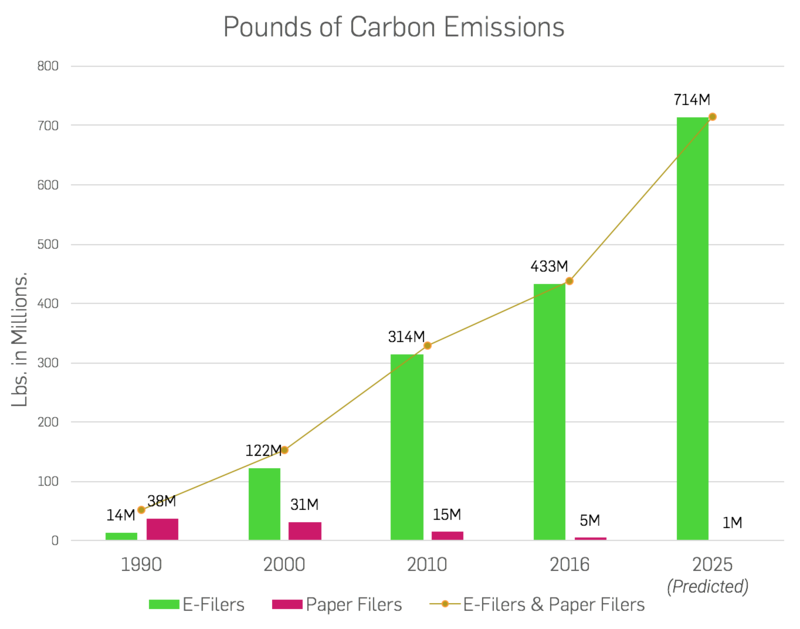 As of 2000, when only 30 percent of Americans had adopted e-filing, the CO2 emissions from e-filers had already more than tripled those of paper filers. As we look ahead to 2025, it is predicted that 99 percent of the country will e-file, producing 714 million pounds of CO2. To put that into perspective, that’s the same amount of CO2 emitted by almost 48,000 homes using electricity for one year. Had we never switched to the e-filing system, the total carbon cost of paper filing in 2025 would instead be 79 million pounds of CO2 (that equates to just 5,000 homes using electricity for a year). We can all agree that e-filing isn’t going anywhere, and I’m not about to spin up a campaign to convert us all back to paper filing. There are, however, actions we can take to minimize the carbon output of tax filing, such as using an energy efficient computer to do said taxes. An ENERGY STAR computer, for example, uses about 60 percent less energy than a standard one. If this hypothesis holds true, we also suggest opting to use a laptop in lieu of a desktop when possible. Desktops, estimated at using 300 watts, require 2.7kWh to complete a typical tax return, whereas laptops, estimated at using 70 watts, require 0.63kWh. Let’s consider this. Based on our assumptions, if every e-filer used a desktop last year, the carbon output would amount to 649 million pounds of CO2, equating to the annual electricity use of about 43,000 homes. Whereas, if laptops were used instead, the output would shrink to 151 million pounds, equating to the annual electricity use of about 10,000 homes. That's certainly something to think about. Comments from Tendril Data Science: The results from this inquiry are based on basic formulas that have not undergone peer review at the academic level. As such, we may be missing key components in the calculations that could improve the results. With that said, these back-of-the-napkin sort of calculations struck us as rather surprising and made us curious to think about this subject further. If true, they become an important lesson in the value of energy efficiency and open our eyes to the potential carbon cost of e-filing. The information below lays out the assumptions used to build an approximation for how much CO2 is used to paper file versus e-file. The International Post Corporation reported in their 2016 sustainability report that mailing 1 letter in 2015 required 37.2g of CO2. We use this number as the lower bound for the carbon used to paper file taxes. Laptops are assumed to consume 70 watts (source1), but e-filings could be made on desktops as well. Desktop computers consume hundreds of watts (source2). To be conservative, we assumed the wattage for e-filing to be 200 watts.